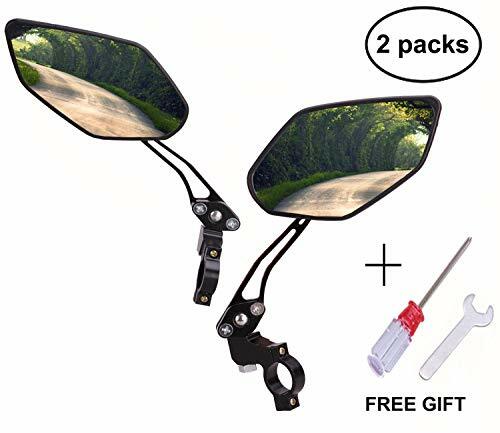 Use our bicycle rearview mirror help you to see the world behind you. Our rearview mirror is designed as a flat mirror which has advantage of a wide field of view and Imaging is not deformed, supporting 360° omni-directional rotation and adjusts to any angle you need, Use a wrench to install it in minutes. 360° in all directions adjustable, it's very easy to adjust your desired angle and hassle-free to install, and the 360° rotation lens can be used on the right or left sides, it does not need to distinguish between the left and light sides during installation. Sometimes treat it as a mirror to check your face or cloth. 30 Day guarantee for your unconditional refund. Order now without doubt. See the world behind You Clearly: Flat mirrors Designed support you clear, undistorted images and more open visuals of the conditions behind you, keep you safe from road accidents. High-quality Materials: The long arm made of aluminum alloy and the rear cover of the mirror made of ABS which provide absolute protection to the mirror against breakage due to some slight bumps. If you have any questions about this product by BIKEIN, contact us by completing and submitting the form below. If you are looking for a specif part number, please include it with your message.